Your antenatal appointments can be arranged in your home (home appointments are at the discretion of midwife. Generally speaking in London trusts this happens rarely but might occur more frequently in more rural areas) at the doctor's surgery, children's health clinic or at the hospital antenatal unit. When you tell your doctor or midwife that you are pregnant, he or she will discuss your options with you. There are usually around ten appointments for your first child, and around seven appointments if you've had a baby before. Antenatal appointments will be more frequent if you have a higher risk pregnancy. Even if you feel fine, don't miss any of your appointments since important routine tests and checks will be done. This article gives an overview of what generally happens at antenatal appointments. Note that this can vary a lot between teams. See below for the link to the NICE guidelines.  5-12 weeks - First appointment - Nutrition advice, overview of potential medical issues.  8-12 weeks - Booking in appointment - Dating scan, blood tests, general check up and an opportunity to discuss options and concerns.  10-14 weeks - Combined screening - Nuchal scan and blood test. Although you will be supported by health practitioners during pregnancy try to remember that this is your pregnancy and each appointment should provide an opportunity to discuss ongoing options, concerns and feelings. By 9 weeks – many women self-refer now, once they have a positive home pregnancy test. This means first appointments are often no longer with your GP but with a midwife at between 5 – 9 weeks of pregnancy. 10-14 weeks – Combined screening (nuchal scan and blood test). 14-20 weeks – Quadruple test if you were too late for combined test. 16 weeks – Follow-up of blood and urine results from booking in appointment and another urine test to look for protein in your urine. Also, your midwife will check the results of the screening tests received. 18-20 weeks – Anomaly scan. Your baby’s growth is checked along with her major organs, such as her heart and kidneys. Your sonographer may also be able to tell you if you are having a boy or a girl, if you have decided that you would prefer to know this before your baby is born. 25 weeks – (first pregnancy only) Blood pressure, protein in your urine, bump size, which should be measuring around 25 cm (10 in) at 25 weeks. If the bump is bigger or smaller, you may be referred for an extra scan to assess your baby’s growth and the amount of amniotic fluid. Your midwife will discuss vaccinations with you, such as whooping cough and flu vaccine (if in season) and the importance of monitoring fetal movements. 28 weeks – Blood test to assess maternal iron levels and look for antibodies in the blood to Rhesus factor. If you’re rhesus negative, you will be offered an anti-D injection to kill off any antibodies in your blood. At this appointment, your midwife will discuss breastfeeding/bottle-feeding. 31 weeks – (first pregnancy only) Blood pressure and urine protein test. Your bump is measured again, fundal height from pubic bone to top of fundus should be around 31cm (12 in) now. You and your midwife will have your first chat about your birth plan. 32­-34 weeks – Repeat scan if 20-week scan showed problems with position of your placenta. 34 weeks – Blood pressure, urine protein and bump checked. Fundal height should now be around 34 cm. NICE guidelines state only one injection of anti d rhesus factor at 28/40 weeks, unless you had an antepartum haemorrhage 6 weeks after the injection at 28 weeks. You can discuss your birth plan with your midwife or obstetrician. 36 weeks – Blood pressure, urine protein and bump checked. Fundal height should now be around 36 cm (14 in). The position of your baby will be checked if in breech position. 38 weeks – Blood pressure, urine protein and bump checked. Fundal height should now be around 38 cm (15 in). 40 weeks – (first pregnancy only) Blood pressure, urine protein and bump checked. Fundal height should now be around 40 cm (16 in). 41 weeks – Blood pressure, urine protein checked. Fundal height is around 41cm (16 ½ in). You may be offered a membrane sweep to help start labour. This is gentler than a fully induced labour. Over 42 weeks – You may need an ultrasound scan to assess the health of your baby. Your baby’s heartbeat will need frequent CCG to check he isn’t in distress and his heartbeats and movements are healthy. An obstetric review is also advised at 42 weeks.  What happens at the first appointment*? Most hospital trusts now offer a self referral service through their website. If this doesn’t happen in your trust/region, you will make an appointment with your GP or midwife as soon as you find out you’re pregnant. At the first appointment, you will be given information on nutrition and exercise during pregnancy, the importance of taking folic acid and vitamin D, as well as not smoking or drinking alcohol. You will be able to discuss the vaccinations, screening and diagnostic tests available to you. You need to tell your doctor or midwife if you have any particular medical issues such as diabetes, high blood pressure, a family history of abnormalities or inherited diseases, previous premature births or other birthing difficulties, or a history of pre-eclampsia. If you need help with English at your appointments, your doctor or midwife will help you get the information and support you need. Similarly, if you have a physical, hearing or sight impairment, let the team know as they can provide additional support if necessary.  What is the booking appointment*? The booking appointment usually happens before you are 9 weeks pregnant and it can take up to 2 hours. You will be given information on baby development, nutrition, exercise, breastfeeding classes, maternity and paternity benefits, and planning your birth. Ask as many questions as you like. You can take your partner or a friend with you. If you are feeling depressed or anxious, it’s important to mention it. There are all sorts of things the midwives and doctors can do to support you and they are very used to providing mental health support and information. At this appointment, your midwife will enter all your information in your maternity notes. You need to keep these notes with you at home and bring them to every appointment from now on. You also need to take them with you to any additional doctor or hospital appointments. If the booking appointment takes place at the hospital, you may have your first dating scan at the same time. You will have blood tests to check your blood group, haemoglobin levels to assess for signs of anaemia and the presence of serious diseases such as syphilis, HIV, hepatitis B. In addition, the baby’s father may be asked to have a blood test so that the team can check for inherited conditions such as sickle cell anaemia. 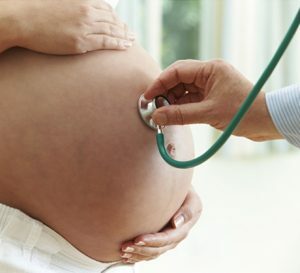  What routine appointments should I expect later in pregnancy? From around 24 weeks into your pregnancy, your appointments may become more frequent. Your midwife or doctor will feel your tummy to check the baby’s position, he or she will listen to your baby’s heartbeat, measure your uterus to see that everything is growing well, take your blood pressure and check your urine. Findings will be recorded in your notes. You mustn’t miss these appointments. High blood pressure or raised blood sugars can sometimes indicate conditions that are potentially serious for you and your baby. If you are having obstetrician led care you may need more blood tests taken at subsequent antenatal appointments to keep an eye on your iron levels. You can help by keeping track of a number of times a day your baby moves or kicks. If the movements suddenly stop or reduce, you need to tell your doctor straightaway. Remember you can ask questions about anything – your birth plan, your breastfeeding plan, what will happen during labour, screening tests, your energy levels and moods, domestic violence – anything that affects you and your baby. You may find you’ve forgotten some of your questions by the time you get to the clinic, so it’s a good idea to write them down so you have a list ready for your appointment.  Note the nature of the appointments can vary between teams. The NICE guidelines on antenatal appointments can be found here.